Relics have long been part of many religious traditions, and indeed Europe is brimming with churches and cathedrals built to venerate literally thousands of these precious remnants of martyrs and saints. In Bruges, Belgium, there is a relic sacred above all others – a vial containing what many believe to be a cloth stained with the blood of Jesus Christ. How did it get there? According to the Apocryphal Gospels, Joseph of Arimathea had preserved the cloth with the Precious Blood after he washed the dead body of Christ. 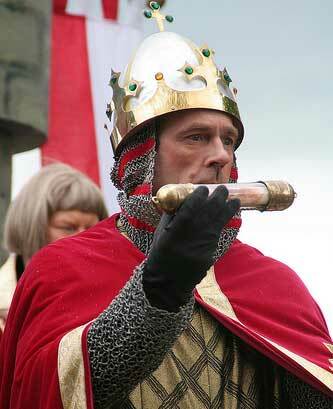 The story is that in 1150, Thierry of Alsace, the Count of Flanders, returned to Bruges with the vial – a gift that had been given to him by the king of Jerusalem during the 2nd Crusade. The private chapel of the count was expanded to properly house this sacred relic and allow visitations, which continue to this day in the Basilica of the Holy Blood. During the Middle Ages, the relic was apparently responsible for dozens of miracles, and perhaps most miraculously the blood was said to change from dried to liquid form every Easter. 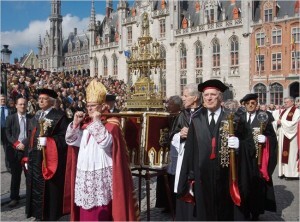 Because of the importance of the relic, the city decided long ago to celebrate it in a very public way – every Ascension Day (May 5 in 2016) since the Middle Ages Bruges hosts the Procession of the Holy Blood. 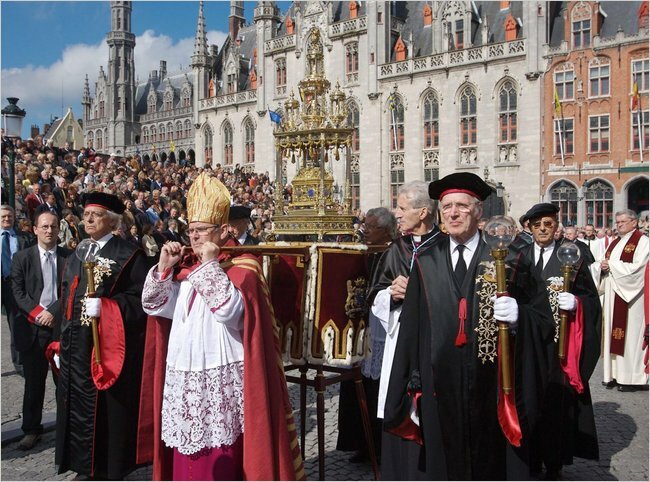 The Relic is placed in a grand reliquary, and paraded around the city with clergy and laypeople alike dressed in fine medieval costumes. If you can’t be there on Ascension Day, no need to worry – you can visit the relic in the basilica. The church itself is quite impressive – the original dark romanesque chapel on the ground floor remains, stark and usually empty, with stairs leading up to the expanded gothic upper chapel. 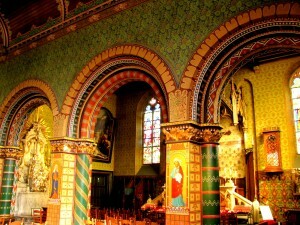 The inside of the upper chapel is vibrantly painted. Interestingly, most of the gothic churches in Europe were painted to begin with, but time has worn away the colours and left us with the familiar grey stone. 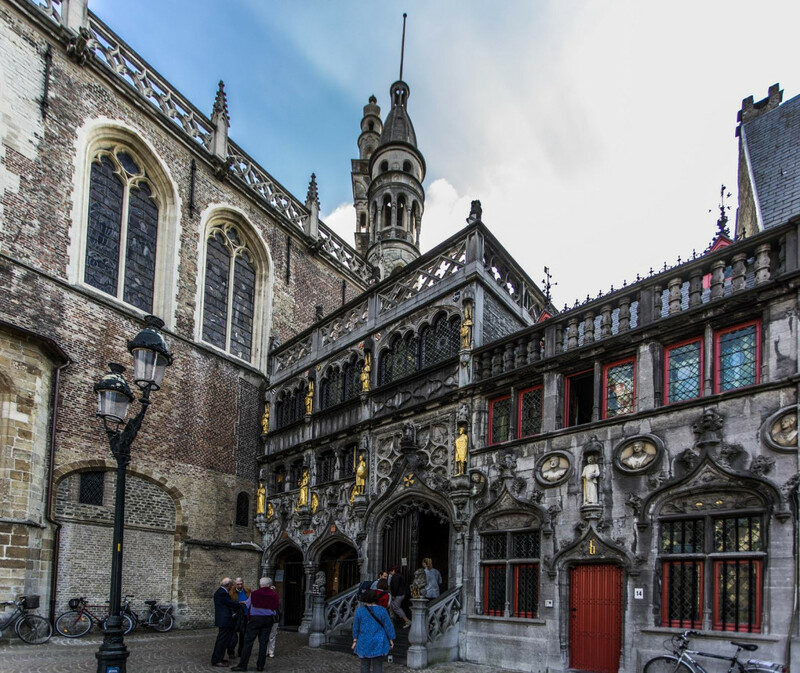 But here in Bruges, you can experience the inside of a gothic church the way the original designers intended, bathed in vivid hues. The relic itself is kept in a side chapel – when you enter just walk straight along the back of the main chapel and you’ll see the reliquary on a raised platform with stairs leading up one side and down the other. So is this really the blood of Christ? 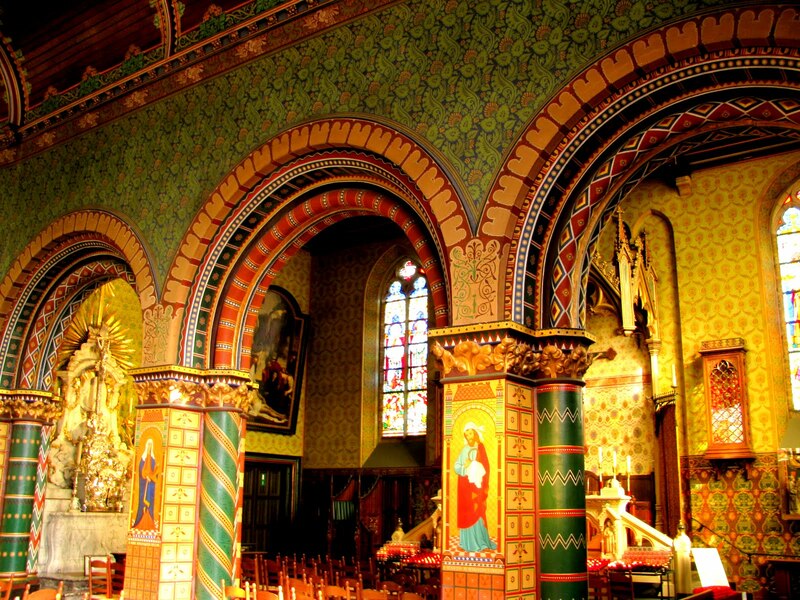 I don’t know if it really matters… Whether you are religious or not, allow yourself to be enthralled by this most sacred of relics in this most beautiful of Belgian cities! For the modern visitor, the Basilica is open 9:30 am – 12:00 pm and 2:00 – 5:00 pm most days – though sometimes access to the upper chapel (where the vial is usually on display) is closed as they have regular church services there. Best thing to do is check in the morning. The rather small entrance to the basilica on the Burg Square with entrances to both the romanesque ground floor chapel and the gothic upper chapel. OneLife Tours is dedicated to the absolute best in European travel experiences. 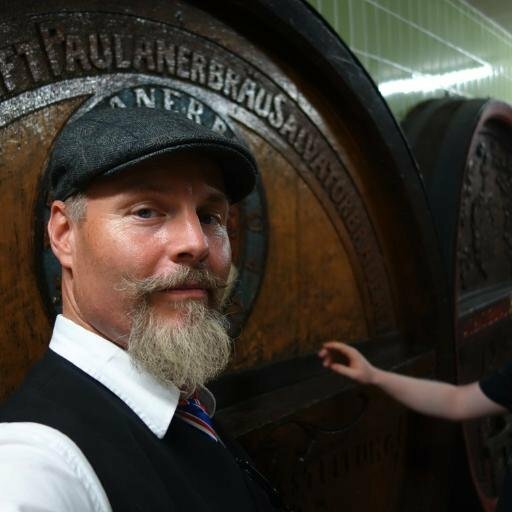 Both our Grand Tour of Europe and our Ultimate Beer Tour start in Bruges, and a guided visit to the Basilica of the Holy Blood is of course one of the many highlights of our stay there. Contact our chief tour director Craig Bresett for more information.